Where has all the GOV stuff gone? 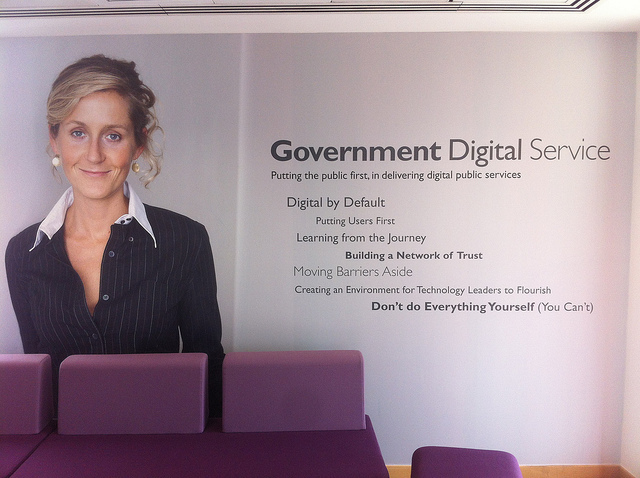 Digital Champion, Martha Lane Fox, first mooted the idea of a single government website back in 2010. Some thought the theory was sound but that delivery would be impossible. Once the project was approved, the process of transitioning government information to GOV.UK began in 2012, led by the Government Digital Service, a new team within the Cabinet Office tasked with transforming government digital services … aka Digital by Default. The aim was to move all corporate information to GOV.UK by the end of 2014. This is now complete with the transition of 312 organisations (so they say). The 216 organisations shown as having a separate website have not moved. Is all this government stuff in one place, designed to be “simpler, clearer, faster”, a Good Thing or “some kind of Orwellian nightmare”? Opinions are divided. Joe Public may be better served, but anecdotal evidence suggests that professional users are not impressed, regarding the interface as dumbed down and asking, "Where has all that useful government information gone?". We've heard from members that finding information from the government has become increasingly harder since departments have moved to GOV.uk. I am posting this discussion to seek views from members about problems they have faced with GOV.uk and if BIALL needs to make a representation on behalf of members. If you have specific examples of information going missing, or info that is harder to find that we can put forward, please do reply below and we can see if we need to take this forward. Ask to join the group if you are interested in following this discussion. It is worth bearing in mind that whilst GDS claims the transition of the websites of these 176 organisations is complete, this relates only to their "corporate" information – the information about their policies, activities, consultations, white papers etc. What is still in transition is their specialist information (which is perhaps most relevant to the professional user) and their specialist web services (apps if you like) which will ultimately be rewritten. MOJ has moved to GOV.UK though much still remains on the Justice website. HM Courts and Tribunals Service (an executive agency of MOJ) has moved to GOV.UK but specialist information like the Civil Procedure Rules is still on the Justice website and the Formfinder service still operates from hmctsformfinder.justice.gov.uk. Land Registry and HMRC have both moved, but again much specialist information is still in transition. Don't worry too much about whether you will find this or that on the old .gov site or on GOV.UK. Google is still your best friend here: use it. GOV.UK is well optimised, so if information has moved to GOV.UK it will show up at the top of the results. Of course, in the move to GOV.UK, some information will have gone missing. But rather than bemoan the fact and despair, my suggestion is follow the GDS Transition Blog, identify the most relevant contact in the GDS team, find them on Twitter and tweet them. 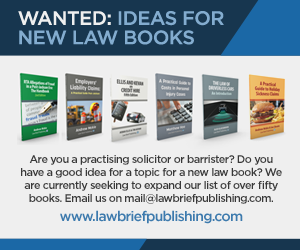 Hammicks Legal specialise in journals, looseleafs, law reports, books & eBooks for lawyers and related professionals. In a move designed to create one of the UK’s largest book distribution operations, they are moving their operations to an enlarged distribution centre in Southampton and expanding their subscription and customer service team based in Ashford, Middlesex. They will also be creating Hammicks concessions in a number of cities including London, Birmingham and Glasgow. Clerksroom was formed in 2001 as one of the first chambers to set up as a "virtual chambers" with most barristers working remotely and a very active and innovative use of IT. There are now over 75 barristers, 1000 mediators and 18 staff operating via a major case management centre in Taunton. The latest innovation is to offer themselves as the management support for all 6,500 Bar Council public access trained barristers in the UK using a new website Clerksroom Direct. There is no charge to the barristers (who are not allowed to share fees in any case) and the system is financed by an administrative fee paid when the client decides to go ahead. The client registers on the system (no fee is needed at that point) and then has oportunities to select a barrister by legal area, level of experience and fee offered. In most cases, a free half hour consultation is also available. BSB Public Access rules have been automated to include online client ID checks through to a secure payment system. Overall, the sustem provides a secure online enquiry, quote, tender, case management, document management and payment system for clients and barristers to engage with each other. A key point for barristers is that they do not have to deal with administrative issues like money laundering regulations, POCA rules, quoting fees, taking pre-payment and client care obligations. Apparently, over 1,000 barristers have already signed up. Is 140 characters too short? There is now an alternative for lawyers – Mootis, the new kid on the (legal) block. Mootis (as it says on the site) "is the new online social networking service for anyone interested in law. Moots can exceed 140 characters – enabling users to express their opinion with more authority, weight and substance. This is not the place for long, boring essays though! Upload and share video blogs, images and audio. Discover the latest legal trends. Make connections. Build your network. Talk to the legal experts. Win new business. Improve your SEO. Expand your boundaries. Registration and access is, and always will be, free of charge." I cannot see from the site who runs it but according to Legal Cheek the person in charge is Manchester Exchange Chamber’s Bill Braithwaite QC. More information comes from Legal Futures. "By allowing lawyers up to 500 words for each ‘moot’, Mootis aims to let them express their opinion with ‘more authority, weight and substance’ than elsewhere. Users, who can register directly or log in through Twitter, LinkedIn or Facebook, can also share videos, blogs, documents, images and audio. They can search and connect with people by name or import existing contacts from other social media networks." There is a very extensive set of instructions on the site about how to use Mootis – that's good! DPS Software has been chosen by the Country Gentlemen’s Association (CGA) to provide management and accounting software. They were the first member organisation to be granted an Alternative Business Structure licence by the Law Society. Based in Warminster, Wiltshire, the CGA was established 120 years ago to provide expert legal and financial advice and small estate management. CGA Legal Services offer a range of advice on personal legal matters, including preparing wills, estate planning, probate and Lasting Powers of Attorney all of which will make use of the DPS software. They have also opted for DPSCloud. LawCare is an advisory and support service designed to help lawyers, their immediate families and their staff to deal with issues such as stress, depression, addiction, eating disorders and related emotional difficulties. The service is free and entirely confidential. It is funded by the key legal organisations (including all the Law Societies in the UK and Ireland and the Bar Councils) but urgently needs further funding to support its work. One of the bodies providing ongoing support to LawCare is Quill Pinpoint, a leading legal process outsourcing service and, in particular, a key provider of outsourced cashiering. Quill is providing ongoing financial support for Lawcare's advertising campaigns in a variety of legal publications, enabling more people to know about LawCare, either who may need the services provided, or who could offer financial support. Well done to both organisations. Are you worried about what will transpire from the current Judicial Review on Duty Contracts? Datalaw, a leading supplier of Legal CPD, offers accreditations (e.g. for Police Station and Magistrates Court Accreditations) and they are are now offering Fast Track Accreditations (in some cases in 3 weeks) providing all the services and support needed. It is becoming clear that it will soon be essential for all criminal practitioners to have both Police Station and Magistrates Court Accreditations if they are not to be treated as second class lawyers. Richmond Chambers specialise in immigration matters and provide immigration law solutions to businesses and individuals across the UK and internationally. As well as a "normal" website and a normal practice based in Covent Garden, they provide a Mandarin website designed specifically for Chinese clients. The site is hosted in Hong Kong in order to ensure fast load times for local people. The site, which has been running for several years, is designed for citizens of China and Hong Kong who may be looking to relocate to the UK under the Tier 1 Investor and Tier 1 Entrepreneur visa categories. It explains the basic requirements for these visas and how they can lead to British citizenship. There are brochures that can be downloaded and videos to explain the processes involved. The site also features links to various Chinese social media channels. Unlock The Law is a new online venture created by Stephen Moore and Alasdair Thomson. Both have legal backgrounds and experience in creating legal websites. The aim of the new site is to explain legal concepts clearly and to help people understand the legal issues which concern them. The information will be provided in text, video, infographics and podcasts. The legal issues arising from current news stories are featured as well as links to informative guides that blend text and video. All of the information is provided free of charge and without the need to "sign up" in any way. The site already has a lot of material, including useful legal guides to particular situations such as personal injury for England and Wales, and for Scotland, and there is a considerable expansion of the content planned for 2015. Hotdocs, a leading provider of automated document generation software headquartered in Edinburgh, has been ranked within the 500 fastest growing technology companies in Europe, the Middle East and Africa (the EMEA area). Hotdocs have developed the business into a global operation, with a new range of cloud based services complementing the well established "in-house" solutions. There are now customers in every state in the USA and in over forty countries worldwide. The software is widely used within the legal, banking, insurance, public and corporate sectors. Hotdocs has won quite a few other awards as well, including International Business of the Year at the Scottish Business Awards this year and a Queen’s Award for Enterprise in International Trade in 2013. 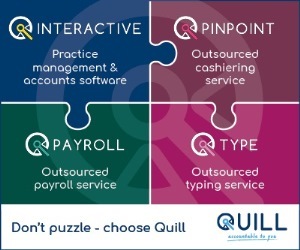 Quill Pinpoint provide outsourced cashiering services for firms of Solicitors. Gunnercooke, started in 2010, now has 60 partners across the country and over 1,000 clients, mainly in the commercial sector. The rapid build up has been made possible by the scalable solution offered by Quill and the fact that the accounts (and other practice management information) can be accessed from anywhere, subject to security provisions. There are 3 offices (2 in London and one in Manchester) but most of the real "work" is done out in the field, with the clients. There is more information on this case study here. From the Law Society Gazette of 1 December: Outgoing SRA chair backs legal apprenticeships. DPS Software are now able to provide forms from Oyez Professional Services from within their case management software in addition to the existing ones already provided within DPS workflows. The integration allows DPS users to access a virtually unlimited forms library, continually updated for any area of law. These forms are then automatically populated with the corresponding information stored within DPS. Once completed, the forms can also be exported as PDF documents if required. 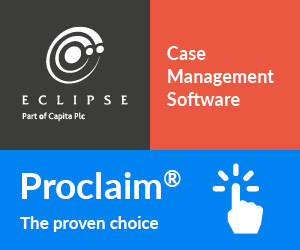 The integration of a major supplier of legal forms (Oyez has been in business for 120 years) with a leading case management supplier (DPS serves over 600 practices) is an important new stage of integration in legal software. Update! I missed the fact that Professional Technology, another very well established and innovative supplier of legal software, also provides total integration with Oyez forms and apparently has done for some time. Sorry! Datalaw delivers more than 350 CPD courses via webinars and podcasts to thousands of solicitors nationwide, covering over a dozen areas of law. It is also a leading provider of mandatory courses and examinations required for solicitors to represent clients in police stations and magistrates’ courts. Now it is aiming to expand further with a six figure investment from the North West Fund for Venture Capital. Over the next year, they aim to quadruple the number of courses they deliver and they will also be launching a new technology platform. Launch of Buckinghamshire Law Plus – a new type of legal firm to help not-for-profit organisations. Buckinghamshire Law Plus is a joint venture between Buckinghamshire County Council and BMKFA Fire Service. It provides a 70-strong team providing expert legal advice in all aspects of public law for not-for-profit organisations in Buckinghamshire and beyond. This is the first local authority in the country to establish an independent legal practice and also the first public sector enterprise to be granted a licence by the SRA as an ABS. Any financial surplus will remain within the county to benefit the community. The new service is expected to be of immediate benefit to cash-strapped small councils, charities, schools and other voluntary groups.